4 WORKSHOPS EACH SHOWING A DIFFERENT STAGE OF THE PRINTING PROCESS. The first workshop will be this Saturday 21 May. The workshop starts off site and will be in the SPS studio after midday until 4pm. 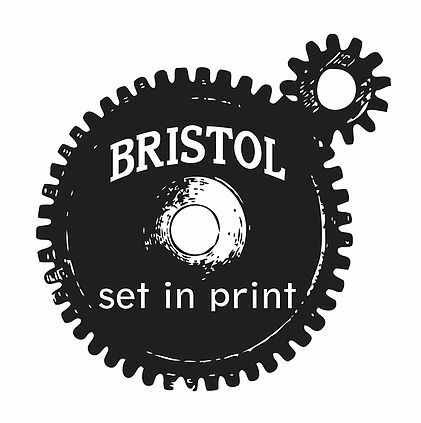 We will start by looking a little bit of History into the background of the Bristol Print Industry. We will have a chance to design the final artwork, together we will create a map of Bristol, looking at where the print houses once were. There will be a workshop going on that day, so we will be meeting in the back room, we will have a chance to have a quick look around the workshop. sketching ideas for map making and being introduced to the history of print in the city and where the print houses once were. here we will have the chance to collect our ideas, We will draw plans and designs for the final map artwork which will be printed over the course of the workshops. We will begin to set the type for the project. Saturday and Sunday will be our final weekend of printing. For this stage we will work with a team of Machine Minders and NATSOPA’s to print the final map.